Thank you to all who attended this succesful day at the innovative Thinktank Museum, Birmingham. Next year's meeting is on Monday 18th May, at the Hilton Hotel, Liverpool. 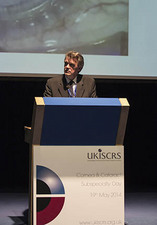 The 2014 UKISCRS Cataract and corneal specialty day on the 19th May proved a resounding success in seeing in the Royal College Annual Congress. 21 distinguished speakers delivered high quality talks which held the audience’s attention for the day. In the corneal section there were excellent updates on infections and inflammation, transplants, eye banking, and refractive surgery. Speakers shared their pearls which should prove invaluable to both junior and experienced colleagues in updating their practice. The talks in the cataract section ranged across diverse subjects from commissioning to new IOL & phaco machine designs to cataract surgery in difficult cases. There was a healthy discussion and participation from the audience through the day. The venue was excellent with enthusiastic participation from trade who took the opportunity to showcase their technologies. Food and beverages were delivered to a good standard and this was well received by all. The UKISCRS looks forward to hosting the satellite days with the ESCRS in September and would welcome participation from delegates. 14:05 - Competition Commission - where are we? 14:25 - What would you do next? 15:05 - Phaco machines - what is new/coming?